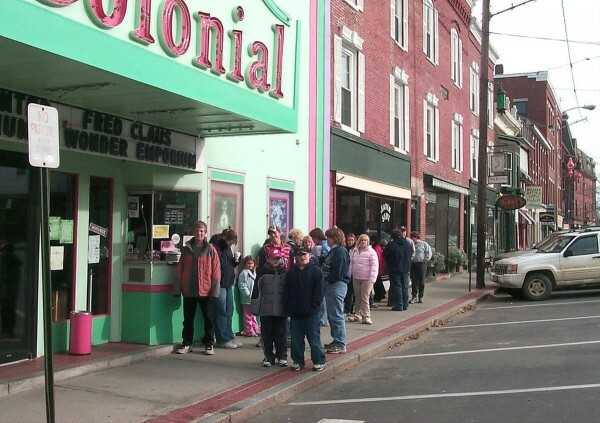 Youngsters and parents wait in line at the Colonial Theatre in Belfast in November 2007. BELFAST, Maine — Birthdays may come around a lot, but when a city’s landmark cinema celebrates its first century of business, it’s worth a lot more fanfare than just a piece of cake and a birthday song. Therese Bagnardi, who owns the Colonial Theatre on High Street along with her husband, Mike Hurley, said that they will be showing free movies dating from each of the last 10 decades in a birthday party that will stretch for months. The Colonial’s history began on April 10, 1912, when it opened the day the Titanic set sail. As with the infamous ocean liner, it has not always been smooth sailing for the art deco cinema. The theater burned in the middle of the night in February 1923, after the last film of the night, a showing of “Way Down East” with Lillian Gish. Bagnardi showed a photocopied newspaper clipping that is displayed inside the theater which described the blaze as “spectacular and disastrous.” Its cause was unknown, she said, although early movie-going could be dangerous because the nitrate film used then was volatile and flammable. After the first Colonial burned, its owners rented the Belfast Opera House to show movies, but a few months later decided to rebuild. By the following January, the theater opened again in its present day building, Bagnardi said, with its art deco facade added after World War II. For many decades, the Colonial also boasted a human landmark in John Grant, who began working there in 1945 and retired 50 years later. In fact, the theater owner at that time was the Kurson family, which also owned and operated many cinemas all over New England. Although they eventually sold their stock of movie theaters, they did not sell the Colonial until 1995. “They kept this one, because John wasn’t ready to retire yet,” she said. Bagnardi and Hurley purchased the theater and renovated it with lots of art deco flair. Old movie posters decorate its walls and the couple eventually tunneled underneath the building to add a third screen, this one featuring a balcony and original stage. “We didn’t know what we were doing, but we just did it,” Bagnardi said. The Colonial’s 100th year will be marked by another major change, she said. Now, movie distribution companies uses couriers to send the theater reels of film, which employees must splice together before placing in the 1947 projectors to show to the audience. A projectionist watches over the projectors, making sure that the film keeps spiraling smoothly through the machinery. “A lot of things can go wrong,” said Will Martell, who has worked at the theater as a projectionist for the last two years. Martell, who spends days in information technology at Maine Maritime Academy in Castine, said that he enjoys working at the Colonial in part because it is different. However, that century of continuity is ending. The distribution companies are moving away from sending reels of film to theaters, instead preferring to go digital. Theaters have to make the switch or die, Hurley figured, even though the costs associated with the new equipment will add up to about $60,000 per screen. This year, Bagnardi and Hurley will phase in the new equipment and put the old “Cadillac” projectors out to pasture, although they will hold on to one for special events. For now, the theater is busy celebrating its century of film. Silent movies from the 1910s were shown to appreciative crowds during January, Bagnardi said. Audience members were encouraged to dress in the clothes of the day, and some did. More movies and events will take place every month, according to Bagnardi and Hurley. For more information, please visit www .colonialtheater.com.